Adding low vision services to your optical is a huge untapped market for opticians and optical shops. For many eye conditions, glasses alone can only help a person so much. After that, magnifiers are necessary to help the person meet their daily reading needs. As an optician, you are in a key position to recognize these patients and help them in ways they may have never known possible, while adding an additional revenue stream to your office. This is in no way an exhaustive article on low vision and magnifiers. What we hope to provide here, though, is a formula you can follow in helping these low vision patients during the course of helping them with their glasses order. 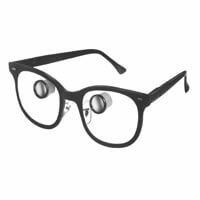 The magnifiers discussed here are very user friendly, extremely good quality, and (all but one) are able to be stocked in your office so that the patient can take it home with them immediately. 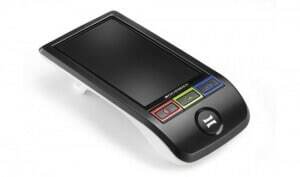 This is the most important step as it will direct the choice of devices shown to the patient. What does the patient want to do that they cannot do now because of their vision? Does the patient want to be able to read their mail? Watch TV? Write checks? See pictures of their grandchildren? Step two: Meet near goals. A good goal to set for reading is 1M / RS40 (typical newspaper size print). You will want to have a reading card at your desk with the word sizes marked to make these basic calculations to be discussed easy. 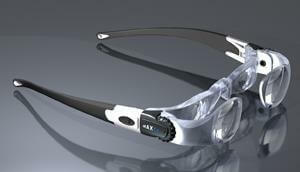 Based on near vision with current glasses, the necessary magnification can be calculated to achieve goal of 1M. For example, if a patient is corrected with a +2.50 bifocal and is able to read 4M size print moderately well at 40cm. The patient’s goal is to be able to read newspaper size print (1M). 1M is 4 times smaller than 4M (4/1), therefore the patient would need to hold the material 4x closer, or at 10cm. This requires a +10.00 add. Obviously, a +10.00 bifocal or asking a patient to hold reading material at 10cm away is unreasonable. 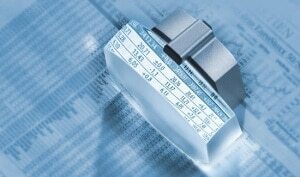 Therefore, instead of building magnification into glasses, we typically place it into an externally held magnifier. Patients often ask why we cannot put a magnifier into their glasses. Reading glasses cannot magnify, they can only set a focal length. For example, imagine trying to see a person across a football field. The person’s features will appear fairly difficult to discern. But when the same person begins walking towards you, you begin to see the features better, until they are face to face and you can make out even finer details. The person was not magnified, they are simply closer to you. This is called “Relative Distance Magnification”. Same principle applies with reading glasses. The reading glasses can have a power in them that shortens the focal length, forcing you to bring your reading material closer to you, but does not physically make what you are looking at bigger. It is only easier to read because it is closer. So instead of asking them to hold it 4x closer, an external 4x magnifier will make the reading material 4X larger while maintaining a comfortable working distance. As glass/acrylic magnifiers become stronger, they become smaller. This requires the patient to slow their reading speed at greater magnifications since they may be reading letter by letter. Digital magnifiers are not prone to this limitation to as great of an extent. 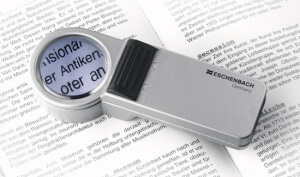 Digital magnifiers are only limited by the size of their screen, since the larger the magnification on the screen the less will fit on the screen. Digital magnifiers therefore are ideal for those with profound vision loss, since the screen size, and therefore magnification, are almost limitless. However, portability becomes an issue with larger screen sizes. Keep in mind these measurements are based on the better seeing eye. There is typically no need to show magnifiers to a person who sees perfect with one eye but has a vision impairment in the other eye. Pros: Stands on its own so hand tremors and fatigue are not an issue. Built in light improves reading in dim environments. Cons: Best used at table. Holding for long term will make it cumbersome. Small size makes this extremely portable. Cons: Small viewing window makes long term reading slow and cumbersome. Pros: Digital device allows for much larger magnification than glass/acrylic device. Magnification can be toggled from 5x to 12X, allowing it to be responsive to differing reading material sizes and to grow with the patients if their vision worsens. Contrast can be enhanced with the push of a button allowing for grey-on-grey newspaper print to be viewed as high contrast black-on-white print. Cons: Best used at table. Holding for long term reading will make it cumbersome. Pros: Extreme magnification, up to 17x. Much larger field of view due to large screen size. Allows for faster reading. Magnification can be toggled from 4x to 17X, allowing it to be responsive to reading material sizes and to grow with the patients if vision worsens. Does not sit on reading material, therefore allows for magnification of 3 dimensional products. Useful for medicine bottles, fingernails, crafts. Large screen allows for longer term comfortable reading without moving magnifier. Reading material sits on tray that can be slid as needed. Cons: Not portable. Patient likely will not move it from original position. Step 3: Meet distance goals. A good goal to aim for with a distance device is 20/40. Magnification need is calculated the same as with a reading device. If a patient with their current glasses sees 20/80 in their better seeing eye, you would want to start with a 2X device (80/40). Pros: Hands free magnification for long term viewing TV and movies. Cons: Does not correct patients refractive error, therefore patient needs to be close to emmetropic for best results. Allows patients distanced correction to be ground into telescope. Cons: Not intended for activities where mobility is required. Custom order, so cannot be carried in stock. Step 4: Meet special needs. 1. As magnification increases, field of view decreases, so start with the lowest magnification as might be needed and work up from there. 2. As trying various devices, record the patients reading speed, for example slow, moderate, or fast, as this is the indicator for real world success. Many patients and low vision trainers may be excited by the ability to see a giant “R”, but not being able to tell it is part of a larger “foRrest”. Always keep your goals in mind. The goal is typically not seeing, but reading. 3. 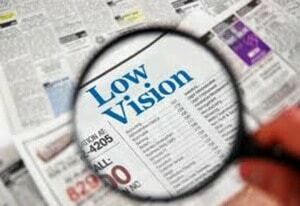 Low vision devices simply make the most of the vision the patient has left. For example in macular degeneration, with a central blind spot, magnification simply makes the reading material large enough to be seen by the peripheral retina. Whereas normal size print may be swallowed up by a macular degeneration scar, magnified print is large enough to see around it. However, the central blind spot will still be present, so eccentric viewing may still be necessary even with a magnifier.